Preserving Traditions’ first canning event, strawberry jam, went pretty well – though it was not without its moments! We discovered that the hot water was a bit…murky, probably because none of the other groups at the Grange use twenty gallons of hot water at a go! It’s probably time to drain the water heater. Luckily, the cold water runs clear; it just takes a bit longer to heat up. There was also a Kettle of Soap incident, which taught us the value of using a properly-sized canning rack to keep jars off the bottom of the canner, instead of improvising with a towel. This makes a pint or so of jam. You can double the batch, but I’ll wait to hear from participants to tell you if it’s ok to triple the batch. Jam can be tricky about triple batches; sometimes it just won’t set. Cook everything together in a large pot on medium-high heat. Once it boils vigorously (it’ll foam up a lot), start timing. After 10-12 minutes, test the jam for jelling. You do this by dripping a very small amount of jam (1/4 tsp or so) onto a chilled ceramic plate. Let it sit for 30 seconds, and tilt the plate. When the jam is properly jelled, the drop of jelly will ooze slowly down the plate. If it’s runny, you’ll need to cook it some more. Turn the heat down to medium and stir constantly. Every few minutes, try the jell test again with a cold plate (keep the plate in the freezer between tests). When the jam is sufficiently cooked-down, you can can it in a water bath so you can store it at room temperature. Or just pour into jars and put the jars in the fridge. 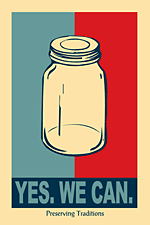 They’ll keep four to six months in the fridge without canning – very nice if you’ve only made one pint. Learn to make homemade pie crust! …and let us know if you prefer not to use lard. We’ll have vegetarian/vegan options on hand for you.